Perfect Pomegranate Margaritas Recipe | Holiday Happy Hour Favorite! 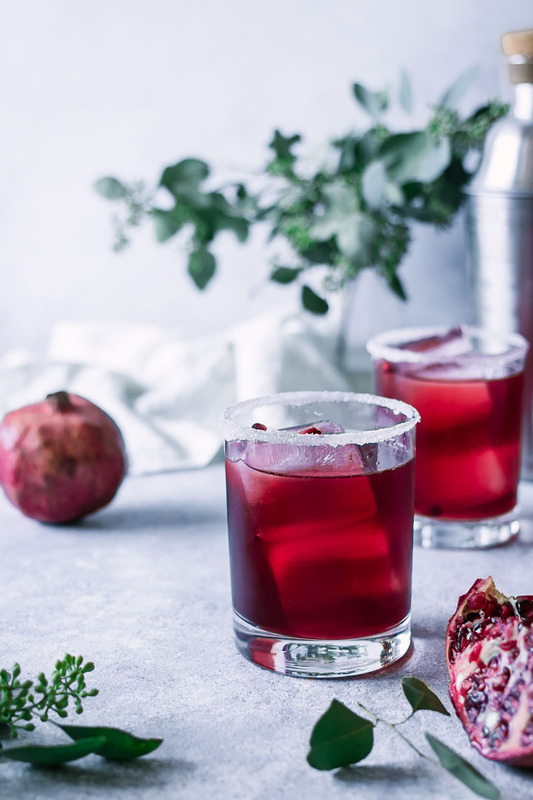 Perfect Pomegranate Margaritas, a healthy winter-twist on the traditional Mexican cocktail. This simple margaritas recipe with pomegranate juice is perfect drink for holiday parties or even just happy hour at home. Cheers! Pomegranates are one of my favorite things about winter. When the earth begins to hibernate and we’re missing summer’s fresh fruits, pomegranates are a bright (red) spot on the winter harvest horizon. 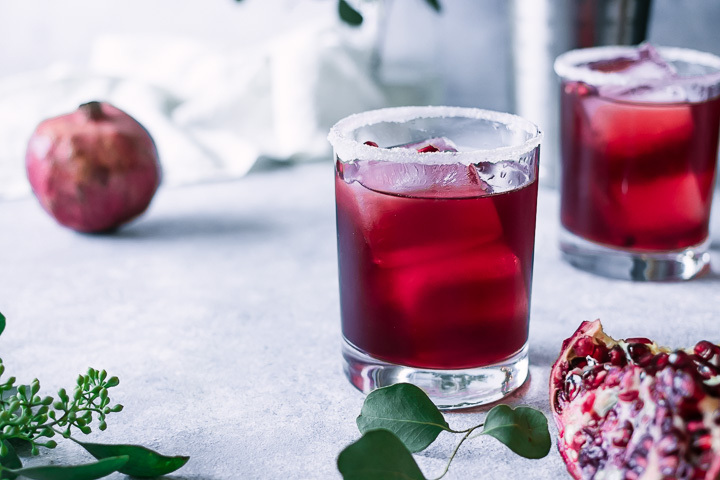 Pomegranate Margaritas are tart, sweet, and perfect for holiday parties, this simple cocktail has only four ingredients and is ready in under five minutes. One sip and you’ll be transported from your cold weather winter to warm dusty beaches (if not in body, then in mind). 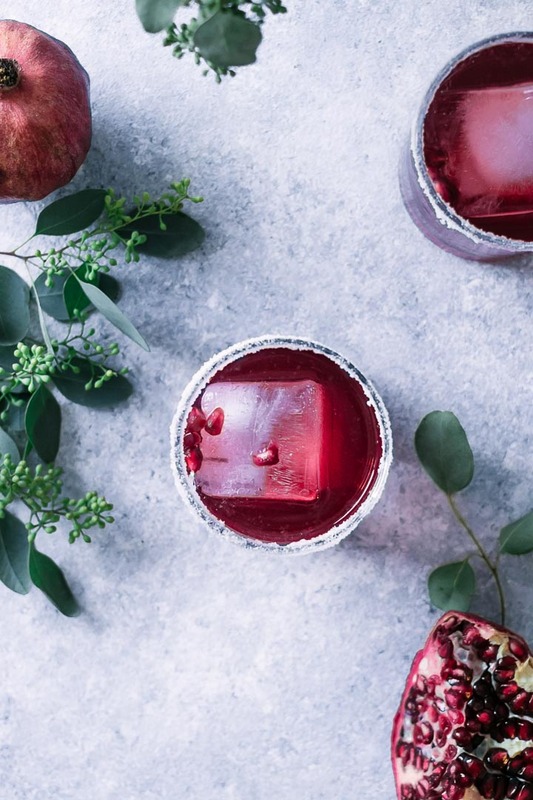 Ready for the recipe that will replace your party punch year after year? Let’s make Perfect Pomegranate Margaritas! 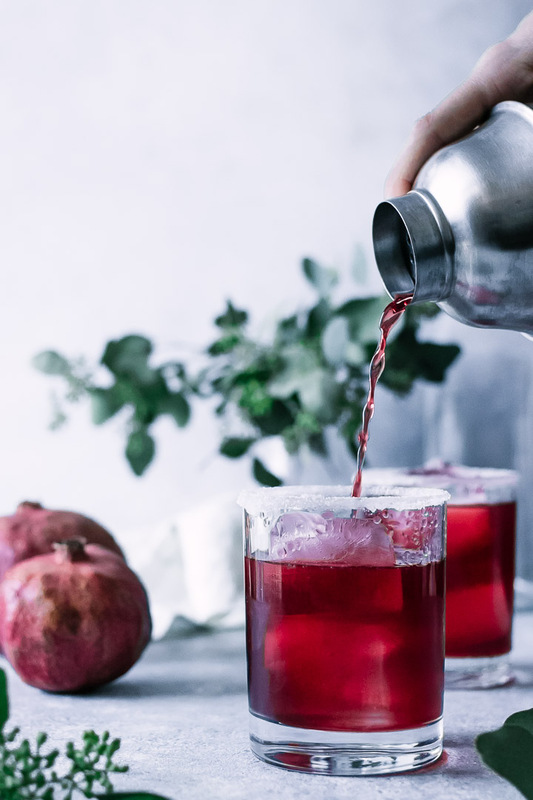 This is the perfect pomegranate margarita recipe to take advantage of the winter months’ pomegranate harvest, and they also happen to be super easy to make — which makes them a great choice for holiday parties. First, combine tequila, triple sec, fresh lime juice, and pomegranate juice in a cocktail mixer. Shake well and pour over a glass with ice cubes a salted or sugar rim (I like a sugar rim for the holidays, or combine them for a sweet and salty taste). Top with pomegranate arils (or pomegranate seeds) and a lime wedge, and enjoy. Add a twist: for a bit sweeter margarita, add a splash of orange juice or agave syrup or simple syrup. I like the orange juice because it smooths out the tart taste from lime juice, but also adds a cloudier look to the margarita (the photos here did not use orange juice, but I do highly recommend). And that’s it! A simple winter-twist on traditional margaritas, your guests will love it. Prep ahead of time: mix the margaritas up to three days ahead of your party to save time. Just add ice when ready to serve. I hope you enjoy this easy margarita recipe as much as we do! For more twists on classic cocktails check out our Homemade Strawberry Mint Spritzer and Homemade Bloody Mary Mix recipes, both perfect for your next cocktail party. Did you make this Perfect Pomegranate Margaritas recipe? Leave a comment below and rate the recipe to let us know how it turned out. Save this recipe for later by pinning to your favorite winter Pinterest board and make sure to tag me on Fork in the Road’s Instagram to show me your cocktail creations! 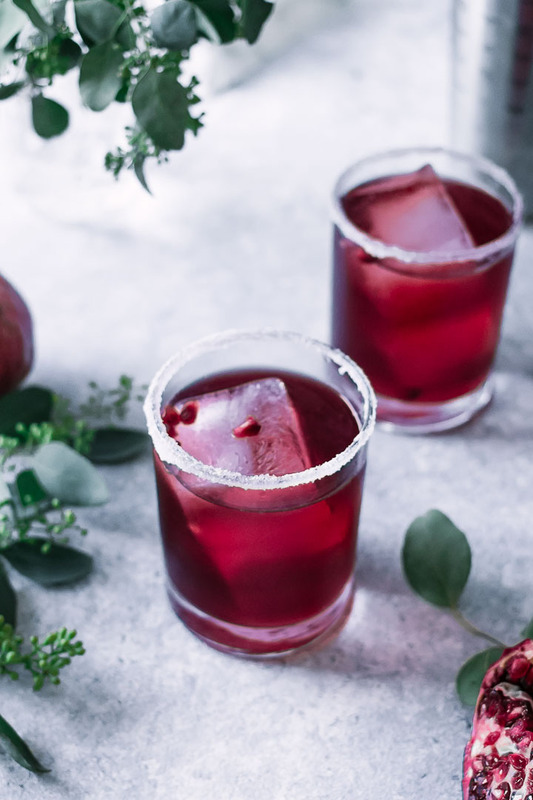 Perfect Pomegranate Margaritas, a healthy winter-twist on the traditional Mexican cocktail featuring pomegranate and lime juice with tequila blanco and a salted sugar rim. Cheers! For Pomegranate Margaritas: combine triple sec, lime juice, pomegranate juice, orange juice, tequila, and agave in a cocktail shaker with 1 cup ice. Shake well to combine. To salt rim: combine salt and sugar on a small plate. Wet rims of glasses with lime wedge and then place glass rim down into salt and sugar mixture. To serve: fill rimmed cocktail glasses with remaining ice and strain pomegranate margarita from cocktail shaker into glass. Top with lime slice and pomegranate arils and enjoy! For pitcher of Pomegranate Margaritas: combine triple sec, lime juice, pomegranate juice, orange juice, tequila, and agave in a large pitcher. Stir well to combine with a wooden spoon, then fill pitcher with ice. To serve: fill cocktail glasses with remaining ice and pour pomegranate margarita from pitcher into glass. Top with lime slice and pomegranate arils and enjoy! For 2 servings: combine all ingredients into a blender with 2 cups of ice and blend, adding in more pomegranate or lime juice for until desired consistency. Nutrition: Nutrition information is calculated for margarita without agave syrup and salted sugar rim. A margarita is a treat, it is not supposed to be a health food (so my professional recommendation is not to concern yourself with the nutrition in a margarita). However, this homemade margarita is low in added sugar compared to many premade mixes.